The ripe fruit of the evergreen tree Ligustrum lucidum Ait. of family Oleaceae. Zhejiang, Jiangsu and Hunan provinces in China. Main plant is cultivated. Plucked the ripe fruit in winter. Slight smell, slightly sour and astringent. Sweet, bitter, cool; liver and kidney meridians entered. Nourish liver and kidney, improve sight. 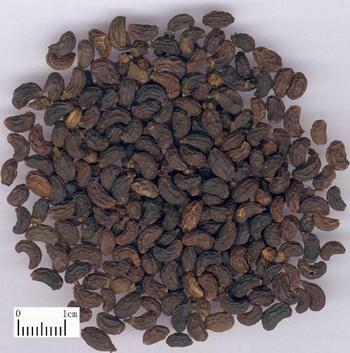 It is indicated for dizziness, blurred vision, dim sight, early white of beard and hair, soreness and limpness of lumbar and knees, spermatorrhea, and diabetes due to yin deficiency of liver and kidney, or tidal fever, restlessness due to yin deficiency with internal heat, because it can nourish yin of liver and kidney, tonifying and clearing spontaneously. Furthermore, it is very indicated for dim and poor vision due to yin deficiency of liver and kidney, for it is skilled in improving sight. It is applied as alcoholic preparation or paste singly; or it is combined with other liver and kidney tonics, for instance, it is used with Mo Han Lian in Er Zhi Wan from Yi Fang Ji Jie. For hypopsia, dim and poor vision due to yin deficicncy of liver and kidney, it is combined with liver and kidney-tonifying and sight-improving herbs, such as Shu Di Huang, Gou Qi Zi. For tidal fever, restlessness due to yin deficiency with internal heat, it is combined with yin-nourishing and internal-heat-eliminating herbs, such as Sheng Di Huang, Qing Hao, and Di Gu Pi. For wasting-thirst due to yin dcficiency of liver and kidney, it is combined with yin-nourishing, kidney-tonifying and fluid-producing and thirst-relieving herbs, such as Sheng Di Huang, Tian Dong, and Shan Yao. Decoct 10~15 g. It is better to be made into pill or powder because the important ingredient of it, oleanolic acid, is difficult in dissolving in liquid. Appropriate dosage for external usage. Streamed with millet wine can strengthen the action of nourishing and tonifying liver and kidney, preventing diarrhea through reducing its bitter and cold properties.